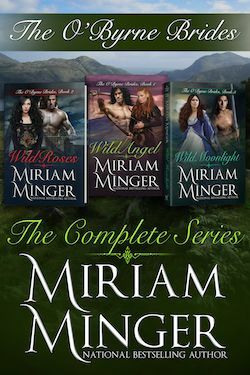 Enjoy three of award-winning author Miriam Minger’s medieval Irish romances: Wild Angel, Wild Roses, and Wild Moonlight! Ronan Black O’Byrne was a legend among men…and the last thing he needed was a troublesome hellion of a woman. Yet this fierce Irish warrior took a deathbed oath to protect Triona O’Toole, a chieftain’s rebellious daughter who would let no man rule her. The gentle sister of Ireland’s most infamous rebel, Maire O’Byrne remains ever loyal to country and clansmen–until a strange twist of fate carries her to Duncan FitzWilliam, the proud Norman lord of Longford Castle. And now she must feign amnesia to ensure her brother’s safety–even as her yearning heart seeks the warm shelter of an enemy’s arms. Many drunken nights have passed and still, Niall O’Byrne cannot free himself from memories of the woman who betrayed him and broke his heart. The brother of Ireland’s most infamous rebel, he rode away from Glenmalure in a wild attempt to escape his misery and vowed to never love again. Yet a half-drowned damsel in distress moves Niall so fiercely that he’ll do anything to protect her from the beast who would claim her. Subscribe to Miriam’s mailing list to learn more about reading her books for FREE!